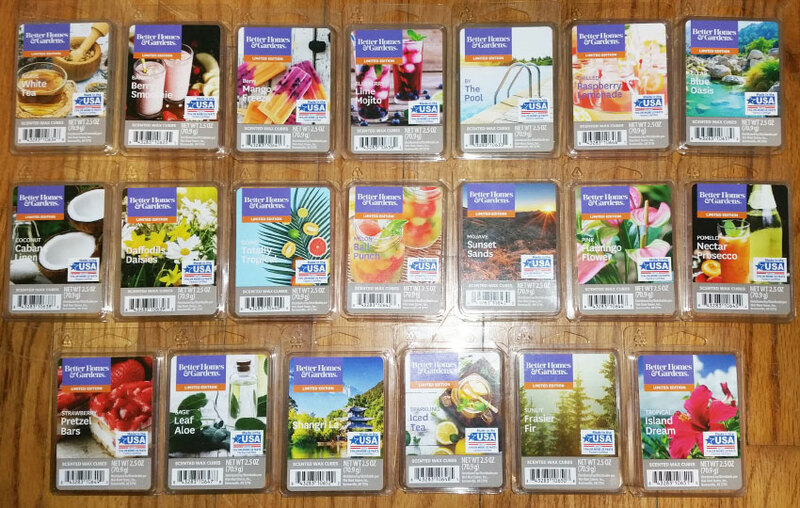 This is a review of Better Homes and Gardens Wax Melts from Walmart for Spring 2019. There are some fantastic scents in this lot, but I think I liked last year's Spring scents a bit more. Notes: Agave and white tea leaves stir together with fresh top notes of bergamot, waterlily, and lemon. The comfort of sandalwood, vanilla and must lay the foundation. This is a very pleasant and delicate scent that smells like a luxurious milky white tea body cream. I can smell a little bit of the tea, but it's very subtle, and it's not a foodie scent at all. It also has a bit of a floral note, as well as a smidgen of an herbal note. And although it's sweet, it's not overly sweet and definitely not perfumey. I really like this one. It's perfect for a bedroom or baby's room. I adore this scent, and if it were stronger I'd buy a bunch! It should work fine in a small room though. Most people in our Facebook group love this scent. This smells like the name, a sweet combination of banana and berries. I smell strawberry with a slight banana note. It's not an authentic scent, nor is it meant to be. It's a fake banana and berry candy type scent that reminds me of the old BB Bats banana flavored taffy candy. I really like it! "It's dominated by the berry. That aspect makes up about 60-70% of the blend and the creamy banana is about 30-40%! Definitely a yummy one!" I smell sweet pineapple and apple, with a hint of some other fruits in the background. It's quite nice. "Almost a dead on dupe for Bath & Body Works Aloha Kiwi Passionfruit. It's a really nice, watery fruit scent that isn't too sweet! There's almost a perfumey aspect in the background as well." Notes: Blueberry and lime with a heart of verbena, peach, and nuances of rum. A touch of mint adds dimension while sugar crystals and benzoin are the perfect finishing touch. This is very similar to the old ScentSationals Blackberry Lemonade scent, but that scent was more lemony and not as sweet, and didn't have as much of a berry note. But it was one of my favorites. This is a fruity scent (I'm not sure if it's blueberry per se) with a lime note and a smidgen of soapy lemongrass. It's very nice. Looking at the notes, this is not an "effervescent" or fizzy scent. And verbena might be the hint of lemongrass. I don't detect mint at all. "I smell blueberry and lime, no mint. Not the same blueberry as Better Homes & Gardens Blueberry Bundt Cake, thank goodness." "Mainly a berry based carbonated scent to my nose, the lime also comes in and adds a fresh zing to the blend! There's the same fizzy drink note in this one as Better Homes & Gardens Ginger Berry Margarita from last year! Really makes the scent realistic!" I like this one! It's coconut with a hint of fruit that I couldn't put my finger on, until I realized it's melon, either honeydew or cantaloupe but I think it's more cantaloupe although it's very sweet, like cantaloupe candy. It's not the same scent as the old ScentSationals Calypso Sands though, as that was honeydew with a sweet floral and maybe a smidgen of coconut. I think there's also a tiny bit of a cologney note, a smidgen of light beach wood to temper the sweetness a little, and possibly a barely detectable hint of chlorine (unless I "think" it should be there because of the scent name). This is similar to Better Homes & Gardens Maui Beach Waves but much sweeter, and with the fruity candy note. It's sweeter when melted than it is on cold sniff. I believe this is the "Splash" side of the old Better Homes & Gardens By The Pool duo from 2016. The scent lasted all day, at least 8 hours. "It's a really soft scent, almost like a very light cologne citrus watery blend mixed with a beachy coconut." A nice fresh men's body wash scent with a strong salty lemon note (which might be the palm). It's sweet but not overly sweet. I have a lot of men's cologne/body wash scents and they usually all smell pretty much the same, but this one is different and I love it. "It's a really fresh/aquatic fragrance with pops of a leafy greenery essence. There is a smidgen of a cologney undertone to it, but it's not overkill run you out the house defcon 5 I need oxygen cologney. It's really good!!" This smells almost exactly like the new ScentSationals Sun Drenched Linen scent, but ScentSationals doesn't put out the same scents at Walmart in the same season. I think Sun Drenched Linen has a smidgen of a cologney note (barely noticeable) and Coconut Cabana Linen has a smidgen of a coconut note. But I think they start with the same base scent, which is a slightly bitter laundry type scent that has a little bit of a chemical note when melted. I don't care for this scent, but I like it more than the Sun Drenched Linen scent. It looks like I'm the only one who thinks they smell the same. "Similar to Sun-Drenched Linen, but that one smells like a fresh men's cologne and Coconut Cabana Linen is brighter with a tropical note." "The linen is stronger and the coconut is not sweet. It's an elegant scent." "I love Coconut Cabana Linen but there are sometimes where I feel like it smells like a public bathroom cleaner." "It's a nice laundry just a very subtle hint of coconut". I adore this scent! I smell orange blossom/neroli and a sweet, rich floral that I can't place, like honeysuckle or magnolia. There's something else in there that gives it a warm sweetness, like a honey note. Looking at the notes, it's probably the musk, and this scent is a little perfumey but it's really more of an authentic floral. It's different from other floral scents I've smelled. It doesn't smell like daffodils or daisies though, since neither of those flowers actually have a floral scent! "Can't place the flowers but very authentic. Does not smell like honeysuckle like Better Homes and Gardens Bluebells and Buttercups does." This smells like men's cologne with another note I can't figure out, like a tropical wood (but not palm, as that has a nutty coconut note that this scent does not have). I do smell a hint of wood and possibly a barely detectable smidgen of pineapple. That other note is a little sour, but not in a bad way. Maybe that note is lemon? It's a dupe of a scent I smelled a few years ago, but I don't remember which one. This is just an okay scent for me. Looking at the notes, the fruits are mango, nectarine, and peach! Someone said this is a dupe for the old Better Homes & Gardens Brushed Teakwood Amber, but I no longer have that scent so I can't confirm. If I remember correctly, they do smell similar. "I think there's a little fruit in there, but it's a clean sunshiney scent, very gender neutral." "This one is super sweet & perfumey! Also borderline floral.. it really doesn't smell like what you'd expect after reading the name! But there's also a strong lemon in the blend too, and I also want to say I'm picking up on coconut? This one is a really complex blend!" "It's kind of musky like cedar but in a summery way." An interesting super salty savory scent with a lemon note and a hint of an herbal note. It might also have a smidgen of bergamot that gives it a barely noticeable fresh cologne note way in the background. It's just barely sweet. I like it. It's very similar to the new ScentSationals Cactus Garden. They're both extremely salty, and savory with a slight lemony note. I think Cactus Garden is slightly more lemony, while Sage Leaf Aloe has a tinge more of an herbal note. I like them both, but I like Cactus Garden a little more. A couple of people said this smells like Yankee Candle Pink Sands, which is a sweet almost perfumey scent. Pink Sands also has a coconut note, and come to think of it, I think this scent also has a smidgen of coconut way in the background (although I don't think this scent smells anything like Pink Sands). Last year this scent only came out in candle form, so I'm really excited that it came out in a wax melt this year! It's a super rich, sweet creamy strawberry scent with a little bit of saltiness. I don't smell pretzels per se, like no bready note, but the saltiness gives it an extra richness that makes this scent so fantastic. A couple of people said this smells a lot like Better Homes & Gardens Wild Berry Cheesecake. "It smells like a syrupy dessert topping strawberry, not a fake scent, very yummy!" "You get the juicy base strawberry note but a hint of salty pretzel also comes in. Love the sweet & savory combo!" It's a pine scent. It's got a little bit of a "harsh" pine note (rather than a smoky woodsy spruce type scent), and I don't detect any other notes or sweetness. It's a nice pine scent though, and perfect for mixing with other scents like orange, lemon, fruit, vanilla, lavender, cologne, etc. "It smells like every other Christmas tree scent. Really crisp & woodsy, no sweetness."